We've written time and time again about the value of monitoring and measuring the impact, activity, and engagement of people in an improvement culture. Doing so enables you to track strategic progress, pinpoint problems, identify top performers, and inspire engagement - among other things. Your activity, engagement, and impact metrics are the vital signs of your improvement culture, yet many organizations fail to take the time to capture and evaluate these KPIs. A big part of the problem is that it's difficult to ensure that everyone logs an impact for every improvement or projects, you wind up trying to compare apples to oranges and can't aggregate the data, the numbers quickly become outdated, and there's no way to ensure that accurate numbers are shared. Continuous improvement software solves these problems. Here's what a few leading organizations have to say about the value of measuring the health of their improvement cultures with KaiNexus. Being able to measure both the financial and the qualitative impacts of improvement - the employee elements, the physician elements, satisfaction, engagement, as well as some of the revenue generation - being able to monitor all of those things from a roll up perspective has done a lot to engage leaders and pieces of the organization that wouldn't otherwise be interested or aware of work that was going on. You need resources to spread an improvement culture, including time, money, and manpower. Where do those resources come from? The senior leaders who approve them, of course. Leaders of continuous improvement frequently run up against the issue that their bosses don't necessarily understand or appreciate the impact of the work they're doing. Even worse, the improvement culture frequently doesn't get the attention and support of senior leaders that it needs to spread. KaiNexus makes it easier to engage senior leaders in improvement by giving them the information they need without bothering them with anything extra. When significant improvements are made, you can choose to notify leaders. 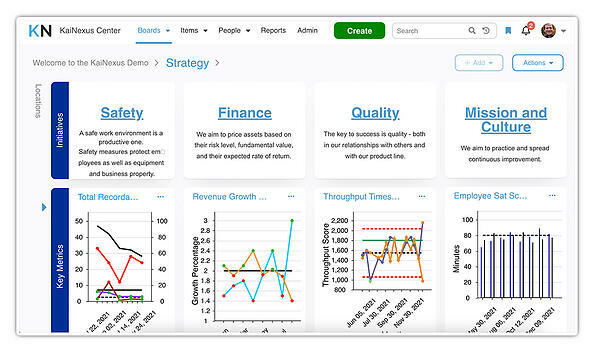 You can also show them progress toward their strategic goals using digital boards, real-time charts, and simple progress and impact reports. They can leave comments in the platform to encourage staff and ask critical questions, enabling them to get involved in encouraging improvement with scheduling unnecessary meetings. Your executives are busy, but they're not too busy to care about improvement if you make it simple for them to get the information they need. It really delivered on our expectation to provide visibility into our culture of improvement and be able to identify which managers are managing well for improvement, and which ones aren't. Which managers are empowering employees to make change, and which are assigning too many opportunities for improvement to themselves. That was all stuff that was going on under the surface and holding us back before, but was totally invisible. It's made checking up on the improvement culture easier for the people who need to be driving it from the top. An improvement culture is driven by the managers who engage front line staff and communicate with senior leaders. While you probably have a team of improvement experts leading efforts in your organization, they're likely working to train other managers on improvement principles and strategies. After all, one improvement coach can only oversee and assist with so many improvements at once. To have a scalable culture, you need your managers to be effective too. It's common for organizations to offer training classes to initiate managers into these strategies, but what happens when the training session has concluded? How do you keep up with everyone, identify bottlenecks, and provide continued coaching? KaiNexus' continuous improvement software makes it possible for improvement coaches to follow up with managers after training in real-time to offer additional coaching when needed and recognition when deserved. 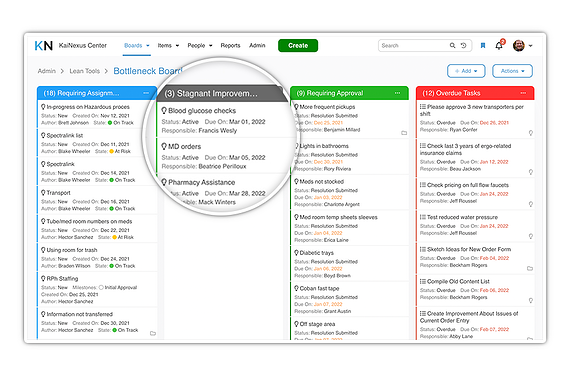 Bottleneck reports show where problems are starting to pop up so coaches can reach out before they get out of hand, and activity and engagement reports show which areas of the organization are doing well and which need more encouraging. KaiNexus gives you the visibility you need to grow your team of effective improvement leaders. 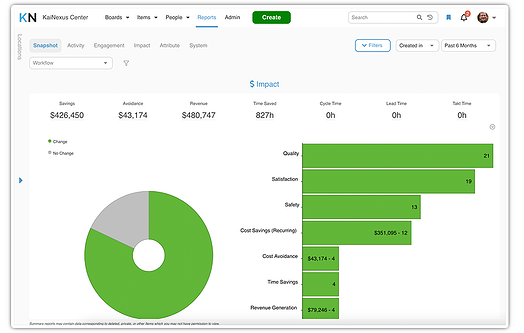 When we're managing and facilitating projects, we document them in KaiNexus and we can pull that up and show the results of those improvements through KaiNexus as we go out to spread. One of the most effective ways to engage staff in improvement is to show them the bigger picture of how their improvements are impacting the organization, their colleagues, and their customers. This is hard, though, when no one has visibility outside of their own work. For example, convincing the team to celebrate an improvement that saves 20 minutes of time per week would be a hard sell. If you were able to aggregate data from around the organization to show how many man-hours everyone has saved, that's much easier to garner enthusiasm for. KaiNexus gives everyone, at every level of the organization, visibility into the impact of improvement from around the organization. When a project is completed, you can instantly pull up the impact of the project to celebrate, and you can use past examples of success to inspire future engagement. You don't need to spend time crunching numbers and building graphs when you have KaiNexus; the data is right there waiting for you to share it.